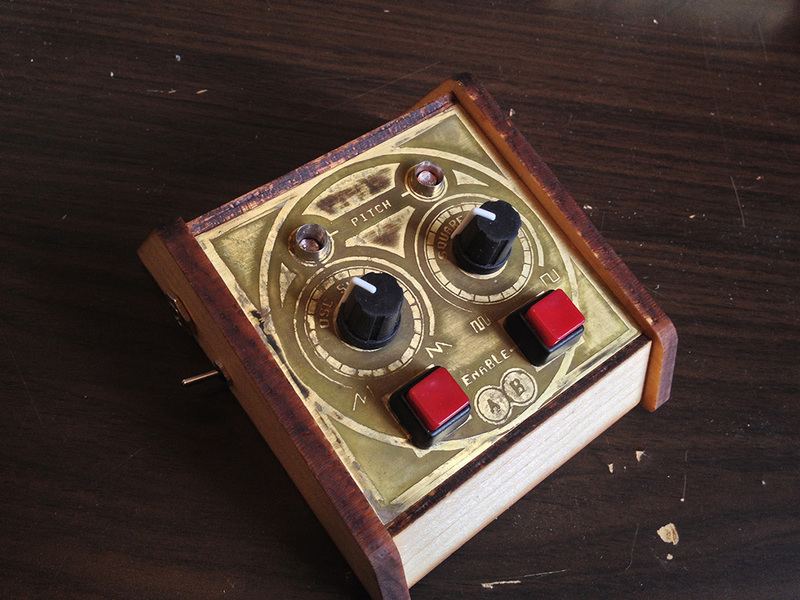 This project stemmed from hours of time spent making funny noises using the awesome Moog synthesizer emulator created by Google. Being able to fiddle with knobs & buttons to craft a unique sound became a bit addicting, and I decided I’d need something more physical to continue making funny noises. I’ve been wanting to learn about the underlying basics behind analog synthesizers for a while, so this is the perfect opportunity to do that and also to make something. What better way to learn? BleepLabs.com sells some really neat DIY electronics kits for this exact type of thing. I picked up a few of them and got to work assembling, but quickly realized they would deserve some kind of case to make this into a proper project. After having such amazing success using a laser cutter to easily create a wood case for my LED Game Hub, I knew this would also be a perfect opportunity for that. This year the Harold Washington Public Library here in Chicago opened what they call an “Innovation Lab” which consists of three 3D printers, two laser cutters, a wood mill, and a vinyl sticker cutter. I designed some simple cases in 3D Studio Max using a spline modeling technique, allowing me to export those flattened splines out to Illustrator to generate a vector file for the laser cutter. For the faceplates, I knew I wanted to do some more metal etching after having enjoyed that process so much during creation of the Audio Infuser. 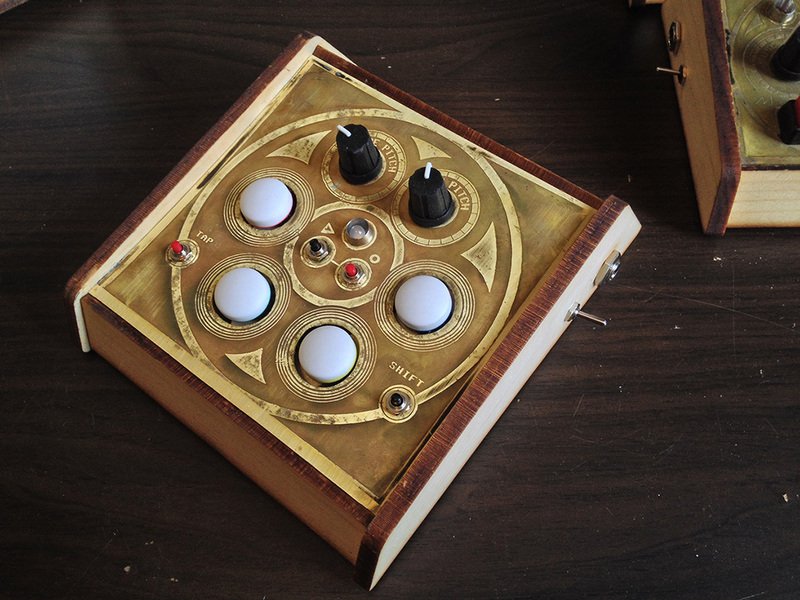 I decided to use brass for this project though, which requires a different etching chemical. Ferric Chloride is used for brass & copper, with the addition of Citric Acid to speed up the etching (it neutralizes a by-product that would otherwise slow the etch). I spent some time working up a design language to use across all the graphics, which I’d describe as a sort of blend between retro and steampunk. I won’t go too in-depth on the actual etching process, but I did a thorough writeup of that at here if you want to check it out. The electronic guts (for 3 out of the 5) are from BleepLabs.com. I got their Nebulophone, Pico Paso, and Bleep Drum kits and went to work modifying them to work within my cases. The kits called for each button and knob to be soldered directly to the circuit board, but I instead used my own panel-mountable buttons and potentiometers so I could easily attach them to the faceplate. Plus it allowed me to customize the look by choosing specific parts I wanted to use. It ended up requiring a lot of wires, though!